In the present paper we discuss single-electron states in a quantum dot by solving the Schrödinger equation taking into account spatial constraints, in which the confinement is modeled by a spherical potential wall (particle-in-a-sphere model). After the separation of variables we obtain second order ordinary differential equations, so that automatic methods for finding a closed-form solution are needed. 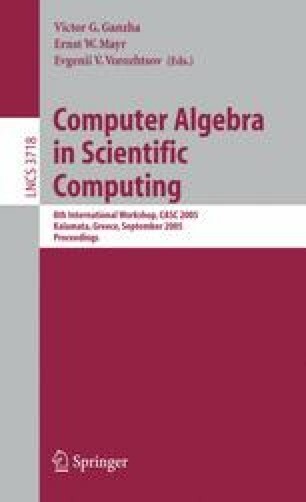 We present a symbolic algorithm implemented in Maple based on the method of indeterminate coefficients, which reduces the obtained equations to the well-known differential equations. The latter can be solved in terms of hypergeometric or Bessel functions. The usage of indeterminate coefficients allows one to obtain the solution of the problem equations in terms of control parameters, which can then be choosen according to the purposes of a nanotechological process.